Video is generally thought of an outbound medium; you create a video, and send it out to the world. However, at VidGrid, we are firm believers that video should not simply be a one-way flow of information. It should be the start of a two-way conversation where you can engage and interact with your buyers. This is why we make videos interactive with calls-to-actions. Call-to-actions open the portal to a conversation. By adding a call-to-action, you are essentially leaving a walkie-talkie where your viewer can press a button to communicate with you. This can be in the form of responses to questions, video responses, meetings scheduled to your calendar, and more. According to recent KISSmetrics study, adding a CTA within a video generates 380% more clicks than a CTA on the sidebar of the same page. Which call-to-action you use depends on what your goal of the video is. Don’t waste a perfectly good lead by asking them to “visit your website for more information.” Decide on your goal, and guide your viewer to success. According to Forbes Insight, ~65% of those who view a video click through to visit the vendor website. 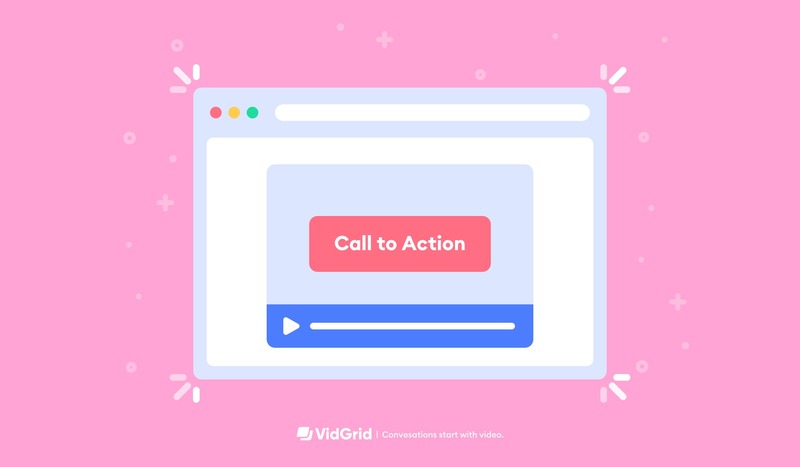 You can link to anywhere on the web with a call-to-action button in your video. Just choose the link and button text, and you’re good to go. Here, it makes sense to integrate your calendar within the video player, so your buyer can book time with you without any complexity. If you want to be stricter, you can make this a quiz question, with correct and incorrect options. If you’re using this for customers, make sure to add some humor so they don’t feel like they are about to get detention. You can also ask your viewer to record a video back to you to ask follow up questions. If this is a training video for employees, you can ask them to paraphrase key concepts to ensure comprehension. Perhaps your goal is not to teach, it is to learn more about your customer. In this case, you can ask your buyer questions to pick up information as they watch the video. You can force buyers to answer questions to continue viewer by making an question required. Ask for basic demographic information, (email, phone number, company, etc.) or for buyer intent data (“are you currently evaluating a video platform,” etc.). Add these at the beginning of the video, or space them throughout at the appropriate times to reduce drop off. Who says forms can’t be fun? Use questions to keep viewers actively participating in the viewer experience. Always have a call-to-action for your videos. Even if you decide against an interactive element, you should know what you would like your viewer to get out of the video. Make CTAs within your video player by clicking the hamburger menu in the upper right. Check out our support article for additional help. Don’t make a CTA required unless at or near the end of a video. You will see the highest rate of video completion if users can skip CTAs. Use emojis 😀! Almost all emojis will work in the player questions. Google emoji codes and you can copy and paste in the question or answer option(s). Save the CTAs you use frequently to your personal CTA library, so you can easily add them to new videos without recreating them. You are on the road to success… All that’s left is to practice, practice, practice.